Esta propriedade é uma cabine privada, não um resort. Excelente localização, excelente vista. "PREÇO ESPECIAL FEVEREIRO:" ALUGO DOIS OU MAIS NOITES EM FEVEREIRO E RECEBER QUASE 25% DE DESCONTO DO PREÇO REGULAR (US $ 165), PORTANTO, VOCÊ GUARDARÁ US $ 40 POR NOITE E PAGAR APENAS US $ 125 POR NOITE. Vá em frente e reserve no preço regular e o desconto será reembolsado por check-in. Sua cabine é projetada para ser acessível por apenas um casal ($ 165), ou dois pares ($ 235), ou mesmo três pares (US $ 305) e, possivelmente, 8 convidados, se dois convidados não se importarem de dormir em um confortável roll out double cama. O valor da base é de US $ 165 para dois convidados e os hóspedes extra são $ 35 por hóspede por noite. O piso principal é composto por uma grande sala de estar / quarto e banho, e uma cozinha completa com área de conversação (com a cama de lançamento). 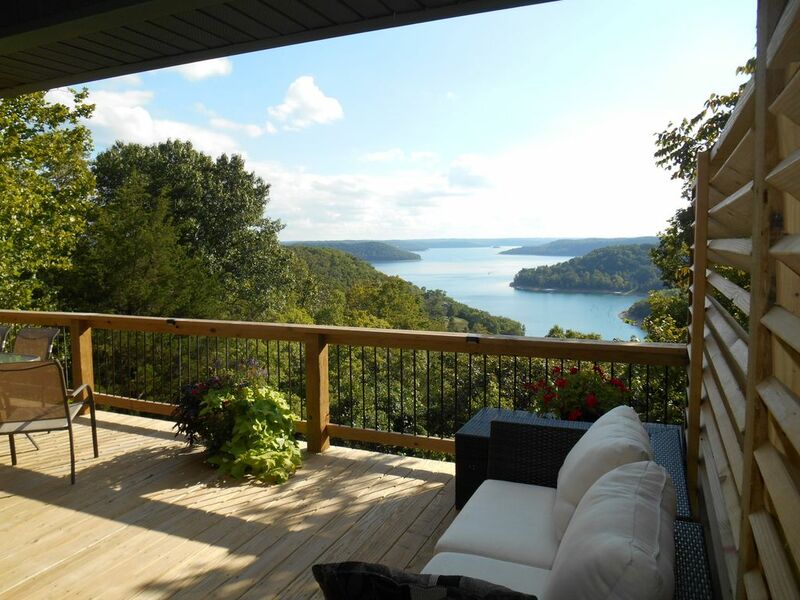 O novo 14 'x 34' deck com vista para uma visão de cinco milhas de Beaver Lake (um dos lagos mais cristalinos da América), que vai deixar você sem palavras. Lá embaixo há dois quartos adicionais e banho. Uma máquina de lavar e secar estão disponíveis, mas os hóspedes devem fornecer o seu próprio detergente, amaciante, etc. Apenas fora é um belo andar embaixo também com uma ótima vista. A banheira de hidromassagem é o relaxante perfeito, você vai dormir como um bebê. Existe uma taxa única de banheira de hidromassagem de US $ 50 que cobre nossos custos de aquecimento e químicos. Então, quando você reserva, certifique-se de declarar se deseja usar a banheira de hidromassagem, e estará funcionando para você quando chegar. Aninhado nas árvores é um novo anel de fogo, e inclui um fornecimento de toras para o seu fogo. Os quatro acres arborizados da cabine estão cheios de vida selvagem. Da raposa vermelha ao cervo da cauda branca, gambá e lince. Em cima, você verá pica-paus, falcões, águias e abutres de peru, para não mencionar uma variedade de pássaros canção. Há uma rampa de lançamento do barco, apenas descendo a colina, uma marina ao virar da esquina e um parque de barragens a poucos minutos de distância. Há até pesca de trutas ou canoagem no rio branco adjacente à barragem. Na cidade, você encontrará todo tipo de entretenimento, desde um novo tirolesa, até um abrigo de animais selvagens com leões, tigres e ursos ....... 'Oh meu!' Você pode até mesmo fazer uma carona no antigo comboio a vapor do antigo. Nossas lojas e restaurantes estão acima do topo com qualidade e singularidade. E se você realmente quer um deleite, peça a Jack para levá-lo em sua turnê especial de Eureka Springs, você vai adorar. Check in time para a cabine é 15:00 e check-out é 11:00. Dois banheiros, ambos com banheiro, vaidade, e chuveiro. Everything met our highest expectations! The cabin/view was exactly like the photos, and the hot tub was ready to go when we arrived! Jack was very helpful and eager to provide information about the area and city. Highly recommended! Beautiful view, plenty of space and nice yard to play fetch with the dogs. Just a little weird that we had to use the living room as one of the bedrooms. Would have preferred to use the two separate bedrooms. Loved the secluded boat slip for the dogs to play! Thanks for everything! It was the perfect getaway! We stayed 4 nights at Cabin’s View and it was perfect. The view of the lake (from about 300 feet above the water, according to my elevation app) is simply spectacular. We sat out there in the sun, the drizzle or the wind, enjoying coffee, each other’s company or just the view. Amazing. Jack is a terrific host, answering every call from directions to checkout with a friendly charm. (One of the shower heads sprung a leak, and Evelyn had it replaced soon after I called. Now that’s service!) The cabin was well-appointed, smartly designed and tastefully decorated, and Jack and Evelyn truly thought of everything. The jacuzzi is an extra $50, but is worth it and absolutely delightful, especially after a day of shopping in Eureka Springs or hiking the many nearby trails. The master bed’s mattress seems a little tired and sagged a bit, but most nights we slept OK. On the days we just wanted to lay around and relax, there was ample individual space to enjoy our own privacy for reading, meditating or even sleeping. Probably not ideal for small kids (there’s a narrow indoor staircase, plus an upstairs deck with an adequate railing, but it’s still upstairs, and it’s on a hill/curve at an intersection of two rural streets.) We checked the “pets” box on VRBO’s search, but Jack didn’t know we were bringing our terrier and told us we should have let him know. No big deal, but he just has a few pet rules that he wants guests to know about. Also, if you just wanna veg out, the cabin is equipped on both levels with DishTV satellite. Jack also gave us a wonderful presentation on things to do/see/eat in Eureka Springs. His enthusiasm for the area is contagious, and his recommendations were spot-on. I can’t recommend Cabin’s View strongly enough, other than to say we WILL be back! We just replaced the king mattress today! Just sorrywe didn't have it in time for you to enjoy, but maybe you'll get a chance to come again. This was the first time my husband and I visited Eureka Springs. We stayed at this small house for 5 days. When we arrived it was a bumpy start. We thought we would have access to the whole house, but the bottom floor with two bedrooms and a bathroom was locked. We only had access to upstairs with the only sleeping accommodations being a queen size bed in the living room. Thankfully when the owner’s wife met us shortly after arrival, she agreed to let us use the whole house so we could have a king size bed. I think since we were gonna be there 5 days they were open to the idea. We didn’t realize when we made the reservation that because there were only two of us we were only going to get access to one queen bed and one bath. In that case, it’s like an efficiency apartment, i.e., the bed isn’t in a separate bedroom. Let me tell you, the separate bedroom downstairs was nice so an early riser can get up and make breakfast while others sleep in undisturbed. Other accommodations like the bathroom and kitchen were as expected. We went to the grocery store when we first arrived and cooked breakfast and dinner every day at home without a problem. Even used the gas grill outside with no problems. Only thoughts about the house otherwise was there is no dishwasher and no use of the washer and dryer downstairs. These are thing we thought might have been useful for someone like us that stayed so many days. My husband would have loved to have a bathtub and WiFi, too. All of this is stated on the website, though, so we weren’t surprised by it. Just stuff to consider when making your choice of where to stay. We did pay $50 for the hot tub and it worked great. The water and chemicals were in good condition. All the knobs, controls, and lights worked. A handful of jets didn’t turn on, but barely noticeable. The cover is good. The tub is close to the house. It has a great view of the lake and tall walls on the sides to give you privacy from cars driving by or neighbors. The hot tub needs a good scrubbing down, though. It has quite a bit of residue or scale on the shell and intake vents. We brought kayaks and bicycles and there is a free boat ramp nearby. Took a while for us to figure out where, but we did launch kayaks from there twice. There’s also a national park nearby on the lake, but it requires a fee. Everything else we did was 20 minutes or more drive away. But there is a lot to do! Outdoor activities, shopping, and restaurants were awesome! I stayed with my boyfriend over Valentines day week during the off-season, we found the cabin to be a quaint with a wonderful view of Beaver Lake. The hot tub was great, when we finally were able to use it because of how chilly the wind was outside. Jack provided us with quite a bit of suggestions when we got there and did end up doing some of them. (We weren’t the biggest fans of him pushing his website, felt a little uncomfortable with it). There were difficulties with some of the amenities provided, as the grill had no propane and when we finally got a new tank it didn’t work very well. The Keurig wouldn’t operate also, so we had to boil water the old fashioned way on the stove. Lastly, when we ran the water it smelled foul of rotten eggs- sulfur/ backed up sewage was what we would get a whiff of, this occurred throughout the entire couple of days we were there. The cabin has quite a bit of rules to follow also just an FYI. We enjoyed getting away for the most part, would've been great if everything worked but maybe things are different during the on season. My daddy used to say you can please some of the people all of the time and all of the people some of the time but you can’t please all of the people all of the time. Starkey Marina e uma rampa de lançamento do barco está ao virar da esquina formar a cabine, bem como lago de pesca, pesca no rio / flutuante, piqueniques, caminhadas, natação e mergulho cênico. Barco e aluguel de jet ski também está disponível. Cidade fica a apenas 15 minutos, todos em estradas pavimentadas. NIGHTLY BREAKDOWN: 1-2 guests $165. 3rd guest $35 (see property description). 4 guests $235. 5-6 guests $305. $100 refundable damage deposit required for all rentals. $55 cleaning fee. $50 one time hot tub fee can be deleted if you don't wish to use the hot tub. Ask the owner about the fire ring option.